Are you ready for more predictable home time? Then KLLM Transport Services has the fleet for you. We are proud to introduce our new Express Fleet. Open to Company Drivers only, our Express Fleet is geared to getting you home on a consistent basis while providing predictable miles through dedicated lanes. Pay ranges from .45 cpm to .55 cpm based on experience. We are also excited to offer a $5,000 sign on bonus for experienced lead drivers that is paid out within 30 days of your first dispatch. Plus don’t forget, pets are welcome! Hiring areas will be Dallas, TX; Atlanta, GA; Harrisburg, PA; and Chicago, IL. JACKSON, Miss., Jan. 30, 2018 /PRNewswire/ — KLLM Transport Services, LLC has announced a major pay increase for both company truck drivers as well as independent and lease purchase contractors. Effective immediately, KLLM solo company drivers are now paid $0.38 to $0.50 cents per mile depending on experience, with OTR teams receiving $0.48 to $0.53 cents per mile depending on experience. Effective February 5, 2018, independent and lease purchase contractors will receive $0.95 cents per mile with FSC on loaded miles. “We also hope that offering a higher income will help us to continue to grow our driver force. Freight is very strong right now and we need additional drivers to handle our freight requirements,” Richards said. KLLM, based in Jackson, MS, offers over-the-road, regional and dedicated temperature-controlled services throughout the United States and Mexico. KLLM has been transporting perishable commodities for satisfied customers throughout the country for 50 years. National Driver Appreciation Week is September 10th thru 16th. KLLM appreciates what our drivers do for the Company and understands the sacrifices they make by being away from their families. We would like to show our appreciation by hosting Lunch events at our terminal locations around the country during Driver Appreciation Week. We encourage as many drivers as possible to stop by one of the terminals for lunch. We will have Management Staff from the KLLM Corporate Office in Jackson on site at each terminal location on the days of these events. Below is a list of dates and activities for each terminal. Tuesday 9/12 – Penn’s Catfish – Driving Academy 11:00 AM – for Drivers and Non-Driving Employees. Penn’s will be serving catfish and fixings. Hamburgers, hot dogs, chicken and sausage will be served at all of the cook-outs. JACKSON, Miss. – KLLM Transport Services has been awarded The Seven Seals Award by the Employer Support of The Guard and Reserve (ESGR). LTC Hugh A. McCallum LG, MSARNG of the 106th Brigade Support Battalion presented the award to KLLM president Jim Richards and Vice President of Driver resources Kirk Blankenship during an August 24th ceremony at KLLM headquarters in Richland, MS. The Seven Seals Award is the broadest and most inclusive award given by the ESGR and is presented in recognition of significant achievement, initiative, or support that promotes and supports the ESGR mission, to include the efforts of the more than 4,500 volunteers who carry out ESGR’s mission across the nation on a daily basis. Employer Support of the Guard and Reserve is a Department of Defense program that develops and promotes supportive work environments for Service members in the Reserve Components through outreach, recognition, and educational opportunities. Established in 1972, ESGR has served our country for more than 40 years, fostering a culture in which all employers support and value the employment and military service of members of the National Guard and Reserve in the United States. JACKSON, Miss. – KLLM Transport Services, LLC will honor 26 Million-Mile Drivers during a banquet to be held August 26, 2016 at the Mississippi Agriculture & Forestry Museum in Jackson, MS.
KLLM will recognize drivers who have driven one (1) million or more safe driving miles with KLLM with no preventable accidents. The Presidential Fleet is composed of drivers with 1 million safe driving miles and the Chairman’s Fleet is composed of drivers with 2 million or more safe driving miles. To date, KLLM Transport Services has over 191 active drivers in these two fleets. Those drivers who are trainers receive the total miles driven by their trainees as well. 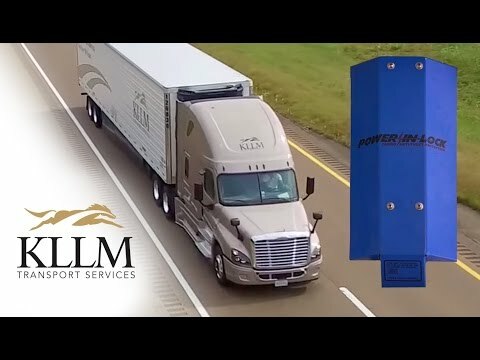 JACKSON, Miss., June 8, 2016 /PRNewswire/ — KLLM Transport Services, a Jackson, MS-based temperature-controlled truckload carrier, is implementing a new level of shipper security by installing Power In-Lock® internal locking systems on its fleet of trailers. The Power In-Lock® system, a remotely controlled deadbolt style lock that was developed by Q Products & Services, serves as an additional level of protection against cargo thieves. KLLM is able to provide shippers with documented proof their product was not compromised during transit. KLLM has worked with Q Products and Services for over a year to ensure the Power In-Lock®system is effective and reliable. Richards stated that KLLM remains at the forefront of innovations concerning food safety and is already compliant with the Food Safety Modernization Act standards that were enacted in April, 2016. “The motto for the Power In-Lock® system is ‘turn your trailer into a safe,’ and that’s exactly the kind of security we like to give our customers,” Richards said. For more information about how this new system can offer customers the peace of mind of knowing their products are maintained and protected, Richards invites shippers to call KLLM. “For shippers whose product integrity is vital, see how KLLM will handle your shipment with the care and security you want,” he said. Temperature-controlled truckload carrier KLLM Transport Services has partnered with Cedar Valley College to open a new KLLM Driving Academy in Lancaster, Texas. The two-story, 44,000-square-foot school will offer an 18-day accelerated truck driver training program to Texas residents. It features classroom, behind-the-wheel training, road and range instruction and driver safety education. The facility features modern classrooms, an onsite physical lab, electronic log and refrigeration labs, a 4-acre backing range, full-service cafeteria and lodging facilities for 43 students. The new residence hall section for the school provides students with refrigerators, microwave ovens, cable TV, WiFi, laundry facilities, computer labs and a study hall. Upon graduation and earning a CDL-A license, students will have the opportunity to be placed as a professional driver with KLLM. “We will be training company drivers and independent contractors, helping them earn their permit and CDL-A and learn about accident prevention, professional driving techniques, D.O.T. regulations, cargo claim management, temperature control chain compliance, and CSA compliance, safety and accountability,” said Kirk Blankenship, KLLM’s vice president of driver resources. The academy is fully accredited and holds a Career School Certificate by the Texas Workforce Commission and is open to any resident of Texas. KLLM currently operates two other driving academies in Illinois and Mississippi for students in those states. KLLM Transport Services/FFE, a Jackson, MS-based temperature-controlled truckload carrier, celebrated the grand opening of a new location of KLLM Driving Academy, Inc. on September 17, 2015 in Lancaster, Texas. Jim Richards, President & Chief Executive Officer of KLLM, cut the ribbon on the new two-story, 44,000-square-foot school in a ceremony with over 300 guests in attendance. The new academy will offer an 18-day accelerated truck driver training program for Texas residents and features classroom, behind-the-wheel training, road and range instruction and driver safety education. The new state-of-the-art training facility features modern classrooms, an onsite physical lab, electronic log and refrigeration labs, a 4-acre backing range, a full-service cafeteria, along with complete lodging facilities for 43 students in private hotel-like rooms. This new residence hall section of the school provides students with refrigerators, microwave ovens, cable TV, wifi, laundry facilities, computer labs and a study hall. Upon graduation and earning a CDL-A license, students will have the opportunity to be placed as a professional driver with KLLM/FFE. The fully accredited driving academy holds a Career School Certificate by the Texas Workforce Commission and is open to any resident of Texas. It is located at 3100 Danieldale Road in Lancaster. KLLM also currently operates two other driving academies in Illinois and Mississippi for students in those states. KLLM, based in Jackson, MS, offers over-the-road, regional and dedicated temperature-controlled services throughout the United States and Mexico. KLLM has been transporting perishable commodities for satisfied customers throughout the country for 52 years. COLUMBIA – Columbia Strong and KLLM Trucking are teaming up – along with support from Columbia residents Danon Jones Vest and Carlton Thornhill – to send relief supplies to those affected in their sister city, Columbia, South Carolina, in the wake of the devastating flooding there. Columbia Strong, a Columbia-based non-profit volunteer organization, began with a grassroots effort born from response need in the aftermath of an EF-3 tornado that ripped through Columbia on December 23, 2014, claiming lives, devastating homes and businesses, and affecting families that holiday season. Columbia, South Carolina responded after the Mississippi storm, and now the Mississippi group is returning that help. KLLM, a Jackson-based transportation services provider owned by Duff Brothers Capital of Columbia, MS, committed to furnish a KLLM truck/trailer for delivery with the capability of hauling 45,000 pounds of relief supplies for the 626 mile haul to Columbia, SC. to help local residents waiting on them. Tommy Duff said he and his brother Jim are glad to be able to provide help to Columbia Strong. “Many volunteers from surrounding states helped us when we were hit by the tornado and we are just thankful that we can play a small part in helping the people of Columbia, South Carolina through this disaster,” he said. Both organizations are asking Columbia residents to fill the truck with supplies this weekend, with specific needs being bottled water. Columbia Strong and KLLM will be on location at the Walmart in Columbia, MS beginning at 9am Saturday, October 10th, until Sunday, October 11th departing at 6pm. The KLLM delivery is expected to arrive in Columbia, SC on Tuesday October 13th at 1pm to help to health and hospital organizations, staff and their families affected in Columbia, SC. For 50 years, KLLM’s refrigerated fleet has been transporting perishable commodities and is ranked the number two temperature controlled carrier in the nation. KLLM offers OTR, regional and dedicated services to a major portion of 48 states and Mexico on a daily basis. For more information about Columbia Strong and KLLM visit columbiastrong.org and kllm.com.